There’s nothing a kid likes better than a Chocolate marshmallow pop! Especially one they KNOW was made with no cruelty involved! 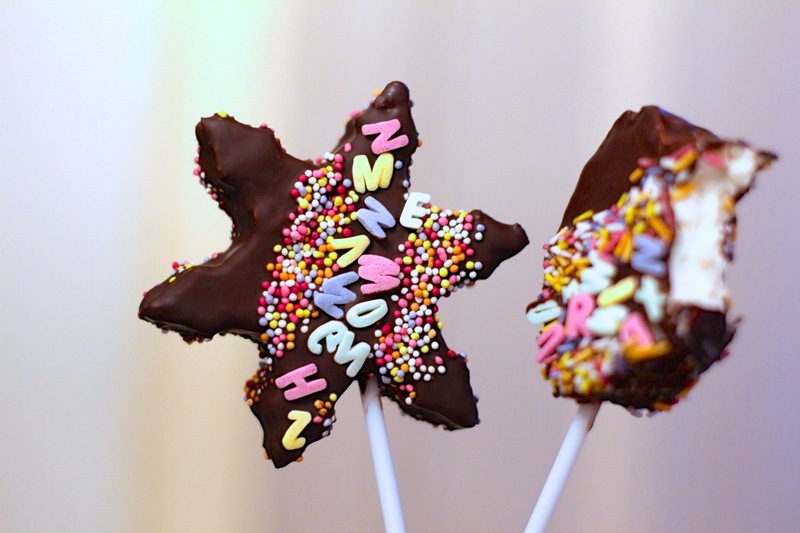 Be the star of the show turning up to an event with these pops, or sending the kids home from a party with not only an impressive looking Mallow pop, but one that is vegan! I kind of like to eat them too, truth be told! Use your imagination and use any shape cookie cutters to cut them out into dinosaurs, stars, flowers etc, or even use a mould to pipe the marshmallow into! 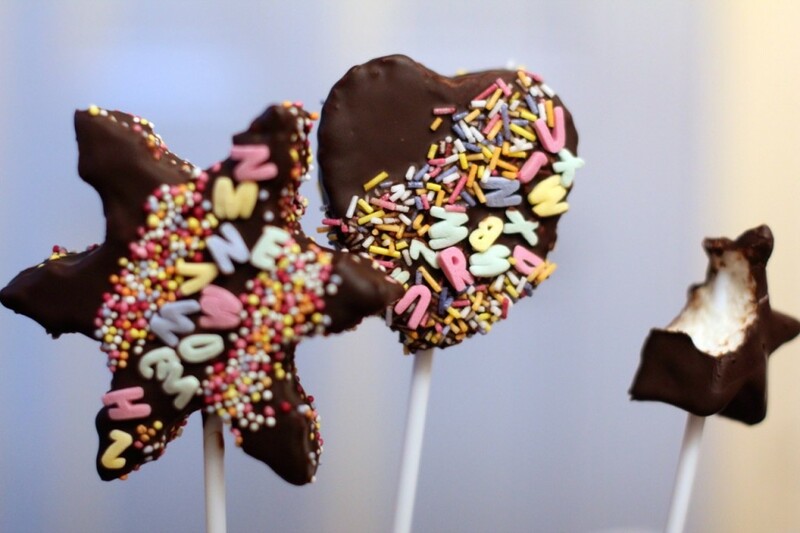 You can use sprinkles, edible glitter, pipe chocolate lines across them..the sky is the limit with how to decorate them! Continue beating for a while as it will cool slightly and increase in fluffiness.If you take it out too soon, it won’t have as much body. 9) Choose your shaped cutters you would like to use, and cut out the marshmallow shapes, and lay out on greaseproof paper. 10) Boil some water in a small saucepan over the stove and place a bowl on top to warm up. Break up your chocolate and place in the bowl to begin melting. 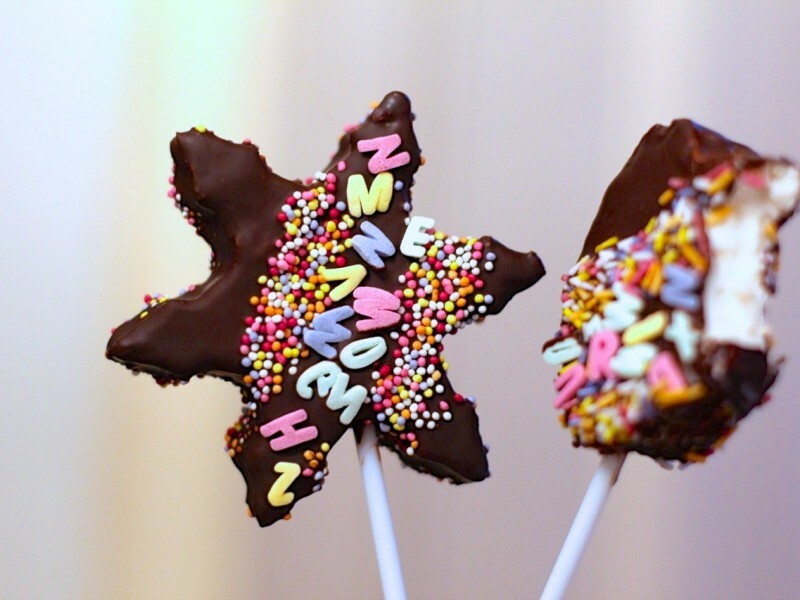 If you have used a high quality chocolate, it will become liquidy, which is great as its easy to coat the marshmallow pops. If it is a lower grade chocolate, you may need to add a tbsp or so of veg oil to make it more viscous, so it won’t end up too thick on the pop. 11) Take your lolly pop sticks and insert them into the marshmallow shapes far enough that they stay in securely. 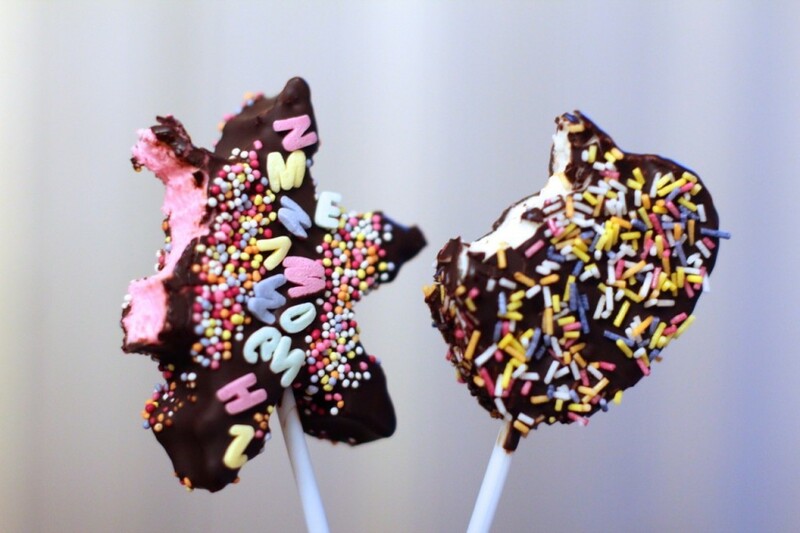 12) Hold the Marshmallow pop over the saucepan, and using a teaspoon,spoon the chocolate over the pop, making sure to cover all the marshmallow. 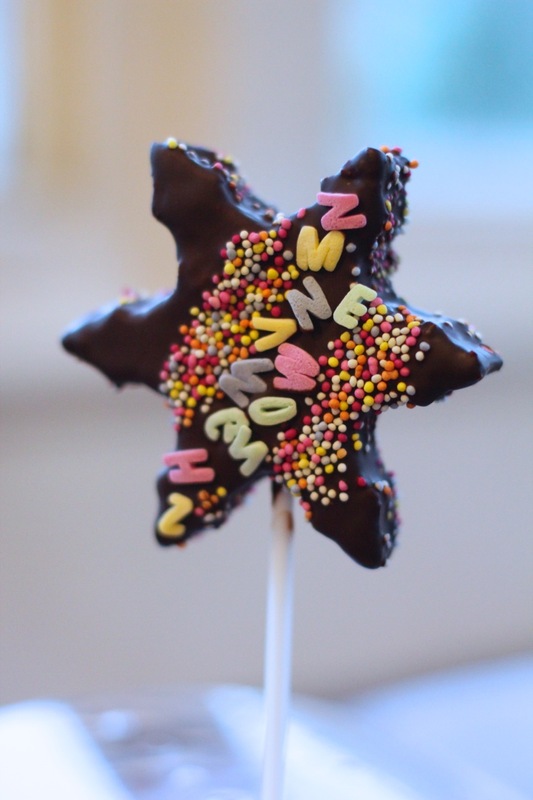 Give the pop a good shake to knock off the excess chocolate so it doesn’t drip, and then add your sprinkles etc to it. If you are going to pipe a design on it, then you will need the base layer of the chocolate to set first. 13) Place each pop into a pop stand, or something else that will keep them separated and up right and place in the fridge to set. You can also put sprinkles, nuts etc on greaseproof paper on a tray and lay them on that to coat one side if you’d like too. Add 405 grams (1 1/2 cups of sugar) and 8.8 grams (2 tsp) of Agar powder plus the 1.3 grams Carob Bean Powder (if you are using it) to a saucepan and stir to combine thoroughly. Add 135 grams (1/2 cup) of water and 115 grams (1/3 cup) of glucose syrup and whisk together over heat to combine ingredients thoroughly. Once the aquafaba has formed stiff peaks and the sugar syrup is ready, slowly add the sugar syrup in a thin stream as the mixer beats it in until all is combined. Continue beating for a while as it will cool slightly and increase in fluffiness.If you take it out too soon, it won't have as much body. Choose your shaped cutters you would like to use, and cut out the marshmallow shapes, and lay out on greaseproof paper. Boil some water in a small saucepan over the stove and place a bowl on top to warm up. Break up your chocolate and place in the bowl to begin melting. If you have used a high quality chocolate, it will become liquidy, which is great as its easy to coat the marshmallow pops. If it is a lower grade chocolate, you may need to add a tbsp or so of veg oil to make it more viscous, so it won't end up too thick on the pop. Take your lolly pop sticks and insert them into the marshmallow shapes far enough that they stay in securely. Hold the Marshmallow pop over the saucepan, and using a teaspoon,spoon the chocolate over the pop, making sure to cover all the marshmallow. 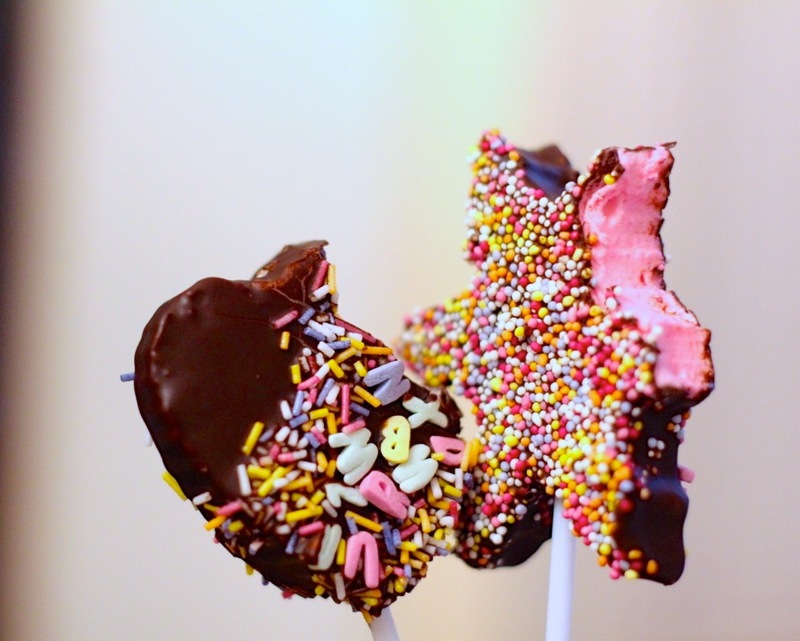 Give the pop a good shake to knock off the excess chocolate so it doesn't drip, and then add your sprinkles etc to it. If you are going to pipe a design on it, then you will need the base layer of the chocolate to set first.